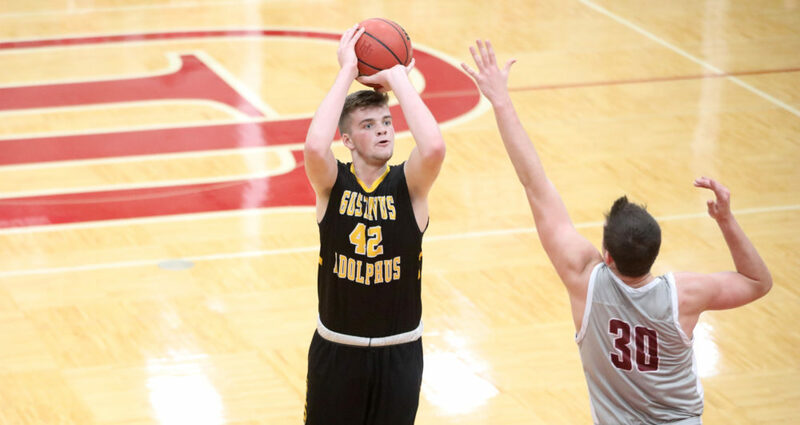 SAINT PAUL, Minn. – The Gustavus men’s basketball team opened MIAC play Wednesday night with a 79-62 loss at Hamline. The Gusties drop to 2-3 overall and 0-1 in the MIAC. Ten first half turnovers by Gustavus allowed Hamline to gain a 33-18 lead at halftime and the Gusties were never able to recover. After shooting just 33.3 percent in the first half, Gustavus shot well in the second half (53.8 percent), ending at 44.7 percent on the night. The Pipers won the rebound battle 38-30 and outscored the Gusties in the paint 38-18. Riley Sharbono (Sr., Marshall, Minn.) led the team with 18 points on 4-of-7 shooting, including 8-of-9 free throws. Vannis Smith (Jr., Crystal Lake, Ill.) finished with 13 points on 6-of-9 shooting from the floor. Gustavus returns home Saturday afternoon to take on Saint John’s. Tipoff is set for 3 p.m.